Beneficial effects, and possible harm, of exposure to weak pulsed electromagnetic fields (PEMFs) may be mediated by a protein related to one that helps birds migrate, according to a study publishing on October 2 in the open access journal PLOS Biology by Margaret Ahmad of Xavier University in Cincinnati and colleagues. The discovery provides a potential mechanism for the benefits of PEMF-based therapies, used to treat depression and Parkinson's disease, and may accelerate development of magnetic stimulation for other applications. PEMF-based therapies induce weak magnetic fields in treated tissue, and have been claimed to temporarily improve symptoms in several diseases; however, support for such effects remains unclear, as do the potential mechanisms. Since the magnetic field strength used in PEMF-based therapies is below what is needed to cause neurons to fire, Ahmad and co-authors asked whether the effects might instead be due to activation of a protein that senses magnetic fields. One such group of proteins are the cryptochromes, which are found in a wide variety of organisms, and which help orient birds to the Earth's magnetic field, aiding migration. The authors found that human cells subjected to a weak magnetic field increased their production of reactive oxygen species (ROS), a group of molecules with multiple roles in cells, including signaling. The increase in ROS slowed cell growth and led to the expression of multiple ROS-responsive genes. Cryptochromes are known to synthesize ROS, and the production of ROS in response to a magnetic field could be blocked by reducing the amount of cryptochrome in the cells. The authors confirmed the presence of ROS, and the reduction in its production after cryptochrome depletion, using both biochemical and imaging methods. These results provide a new mechanism for explaining the effects of weak magnetic fields on human cells. While proposed harmful effects of such fields on human health have been difficult to confirm, the cryptochrome-induced production of ROS, which can be damaging in excess, may explain how such harm could occur. At the same time, the potential beneficial effects of PEMF-based therapy may be due in part to the signaling function of ROS, triggered by activation of cryptochrome. Importantly, since cryptochrome activation and ROS production are quantifiable, this study points the way toward teasing out cryptochrome's contribution to both the benefits and the potential harms of exposure to weak magnetic fields. "Our findings provide a rationale for optimizing low-strength magnetic fields for novel therapeutic applications," Ahmad said. "At the same time, they suggest that alone, or in combination with other environmental triggers of ROS production, such fields have the potential to negatively impact public health." 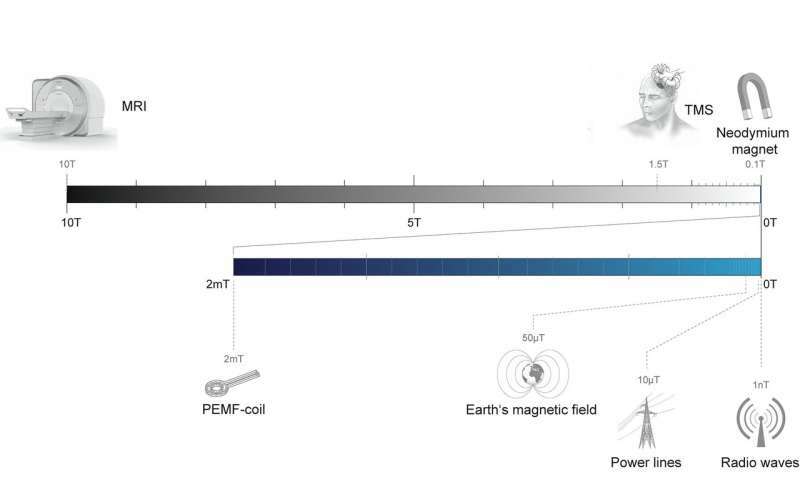 Because of the nature of claims relating to the biological effects of weak magnetic fields, PLOS Biology decided to commission an accompanying "Primer" article by Lukas Landler and David Keays. In their Primer, the authors place Ahmad and colleagues' study in the context of the skepticism that has surrounded some previous claims in this field: "The critical yardstick in assessing the validity of these claims is an assessment of the controls they employed. This reveals a big improvement on existing papers, but the controls are still imperfect." Nevertheless, say Landler and Keays, "Should this paper be independently replicated by multiple labs it will undoubtedly be influential. It is conceivable that leukemia associated with 50 Hz power lines, PEMF mediated ROS generation, and animal magnetoreception are mechanistically similar—each requiring the presence of cryptochrome... It may well transpire that cryptochrome is a magnetosensor, but one with a sinister side."